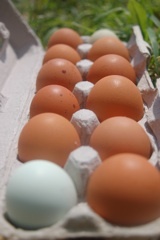 Farm Fresh Eggs from Happy Hens Available Thursday! $4 a dozen at your depot! You’ve been asking for it, we’re delivering! This week, pick up farm-fresh local eggs at your depot. From Bear Hill Farm in Tyngsboro, the chickens are barn-raised, free-range and antibiotic free. Eggs are available on a first-come, first-served basis for $4 a dozen – we will bill your FDC account. Pick up as many as you’d like until they are gone – just mark next to your name that you’ve taken eggs. If you’ve never had local eggs before, you have to try these – the yolks are beautiful, they are tasty and packed with nutrition.